Cruising along in the mid-Atlantic with an underwater camera in tow, scientists aboard the research vessel Atlantis were expecting a routine day of sea-floor mapping until a crew member noticed some unusual formations rising up within the camera’s view. 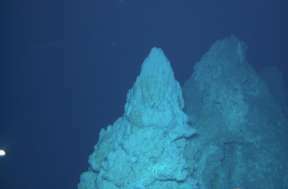 Floating thousands of meters above the Atlantis Massif, an undersea mountain built of million-year-old oceanic crust, the vessel stumbled upon a giant hydrothermal vent system, towering high above the sea floor. Now dubbed the “Lost City,” the vents are easily the largest ever discovered. The details of their formation in this volcanically quiet region, however, are still a mystery. The best known type of hydrothermal vent is the sulfur-rich “black smoker,” found in regions of high volcanic activity. In contrast, the vents discovered on Dec. 5 spew scalding fluids rich in carbonates and silica and grow on old, cold crust, far from any current volcanism. The unexpected discovery came at the end of a research cruise that had set out to map the Atlantis Massif. Scientists on board had little time to collect as much data as they could while still completing their original research objectives. Back in the lab, as they pore over fluid composition data, the scientists are left with more questions than answers, and an exciting new undersea world to investigate. While pinning down the age of these vents is troublesome, the scientists have a better understanding of where the heat might be coming from. The Atlantis Massif is made up of very old peridotites — coarse-grained plutonic rocks rich in olivines and pyroxenes — that easily alter into serpentine in the presence of seawater. The presence of old peridotites in a region that has been very tectonically active brings up different ideas as to how these vents may have formed. Serpentinization is the exothermic process by which peridotites are chemically altered. If seawater were to be carried down to depth along the many faults that riddle the massif, the rock could alter into serpentine and in the process, release heat and other elements that could then rise up toward the ocean floor. As the mineral-rich waters reach the cooler seawater, they could deposit the minerals as the hot fluids escape and cool. Blackman is excited about how the formation of the Lost City might be related to one of the team’s original goals — to determine the uplift mechanisms of the Massif. “Were there basalts on top [of the peridotites] that were stripped off during uplift and only now serpentinization can occur?” Blackman asks. If the peridotites were overlain by other rocks that were then removed during the formation of the undersea mountain chain, then the timing of the vent formation would be closely related to mountain building events. Blackman notes that some of the heat may also be derived from tectonic activity.